There are two main camps in the debate over how many sets you should do. One group believes that one set is enough and you get little to no benefit from doing extra sets. The other group believes that multiple sets will make you significantly stronger. Which group is right? How many sets should you do? There are some individual studies supporting both sides of the argument. However, a couple of relatively recent meta analyses strongly support multiple set programs. The first found that multiple sets were responsible for a 48% strength increase over single sets. Significant gains were found in the 2- 3 set range, with slightly larger, but insignificant results found in the 4- 6 set range. 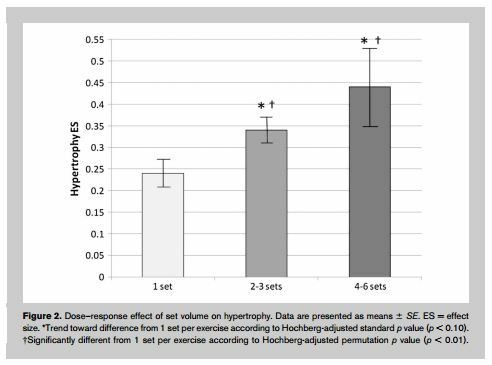 The other meta analysis found that multiple sets let to 40% greater hypertrophy (muscle growth) than single sets. It found that 2- 3 sets outperformed 1 set and 4- 6 sets outperformed 2- 3, but not by a significant margin. Both studies found benefits of multiple sets for both untrained (lifting for less than 1 year) and trained (lifting for more than 1 year) participants. Because most of the studies analyzed compared 1 to 3 sets, 3 sets per exercise is a good starting point. You will also experience strength and hypertrophy gains from only doing 1 set per exercise (albeit not as much). If you are a bodybuilder or otherwise trying to gain as much muscle as possible, you might want to move into the 4- 6 set range even though the incremental benefits of those additional sets won’t be as significant. Krieger, James W. “Single versus multiple sets of resistance exercise: A meta-regression.” The Journal of Strength & Conditioning Research 23.6 (2009): 1890-1901. 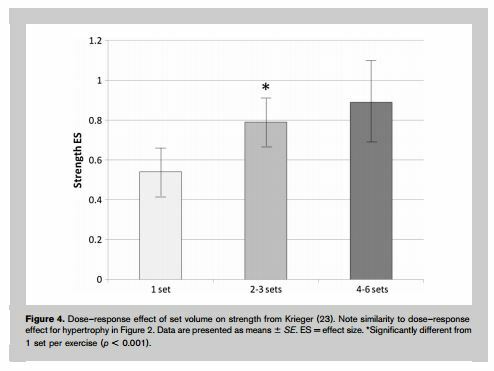 Krieger, James W. “Single vs. multiple sets of resistance exercise for muscle hypertrophy: a meta-analysis.” The Journal of Strength & Conditioning Research 24.4 (2010): 1150-1159. Do Post Activation Potentiation Workouts Work? Should You Train to Muscle Failure?